In 2007, researchers were scouring over satellite imagery of the remote Canadian wilderness on Google Earth when they spotted something incredible - a beaver dam so massive, it is visible from space. Measuring in at some 2,790 feet in length, the enormous structure even rivals many of humanity's most impressive creations. Among those who heard reports about the discovery was Rob Mark, a modern-day explorer who was eager to embark on a challenging new adventure. "I read an article about it and was fascinated that something was that big. Then I read couple of other articles about it and there were two recurring themes: one was that it's incredibly remote and very difficult to get to, and the second was that no one has ever been there," Mark tells The Dodo. "Those two things met my criteria, so I started doing my research on what it was going to take get there." After plotting a rough course that would take him through some of the most impassible terrain on the planet, Mark packed his gear and traveled to Fort Chipewyan in northern Alberta, Canada, the last outpost before his 120 mile trek to the dam. It took him nearly five days to arrive, bushwhacking through the untraversed landscape, inching closer to the beavers' hidden fortress. "This was the toughest bit of journey I've ever been on. The land is flat, but the vegetation is so incredibly thick. 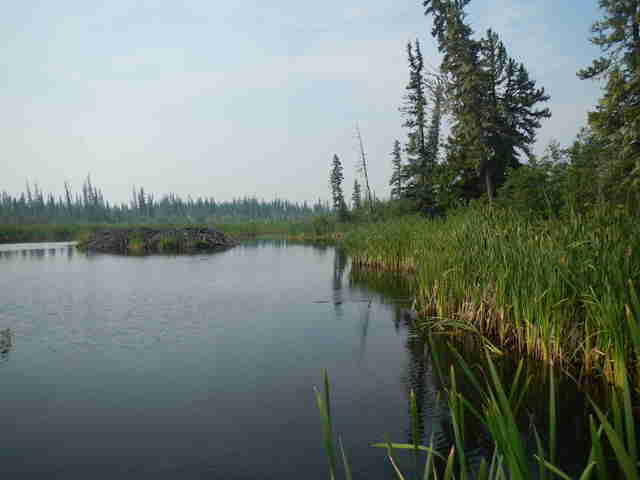 Then you're walking through muskeg and that turns into bog, then out and out swamp," he says. The last mile stretch before the dam was so boggy, Mark says it took him five hours to pass through, but the effort was all made worth it when he first laid his eyes on the beaver's creation. "There was a great sense of relief. I felt a great peace and calm come over me. It was just an incredible feeling knowing that I'm the first person. No one has ever walked where I'm standing before," says Mark. "These beavers have it made. All they're doing is cutting down the willows and the trees for them to eat the bark off of. They don't have to do anything more with the dam. The parts of the dam that I saw, there was no new construction going on whatsoever. They just have a really nice place to live." Biologists believe that the beaver dam took about 20 years to build, dwarfing what was previously thought to be the largest dam in the world, a 1,956 foot dam found in Montana. Beavers use these structures to give them protection from predators, and to allow them to continue hunting for food under water even after the surface has frozen over. 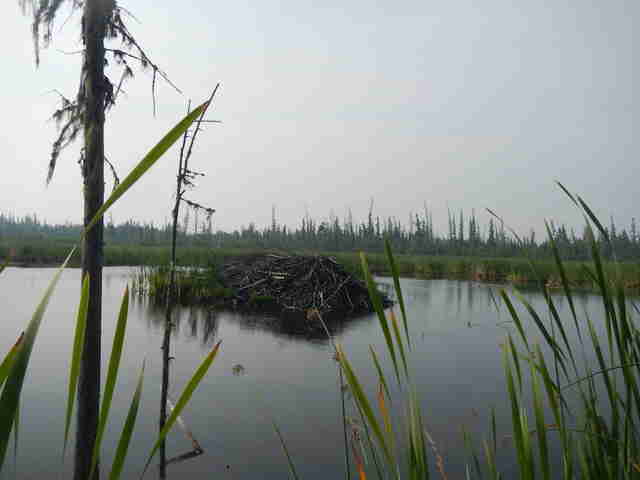 Beavers are one of the few animals, aside from humans, whose constructions can significantly reshape the surrounding landscape, creating a new wetland ecosystem for other species to thrive in. Although the dam only stood about four feet high, it stretched out more than a half-mile wide, covered in vegetation and mud. As he traversed the record-breaking structure, avoiding the beaver lodge where the animals actually live, Mark says he happened upon one of its proud residents - but the animal was none too happy to see a visitor near his secluded hideaway. "There was a lone, big beaver. I expected, never seeing a human before, that the beaver would not mind my presence, but it was the exact opposite. He was incredibly angry and kept splashing and slapping his tail at me when I was standing on the dam," says Mark. 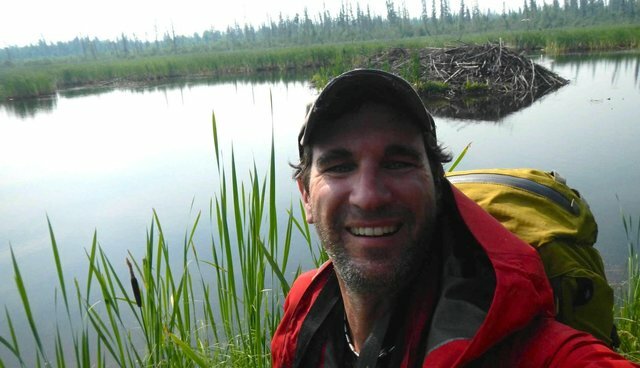 Not a scientist himself, Mark says he hopes that his trek will inspire biologists and naturalists to visit the site to get a clearer understanding of just what beavers are capable of building. 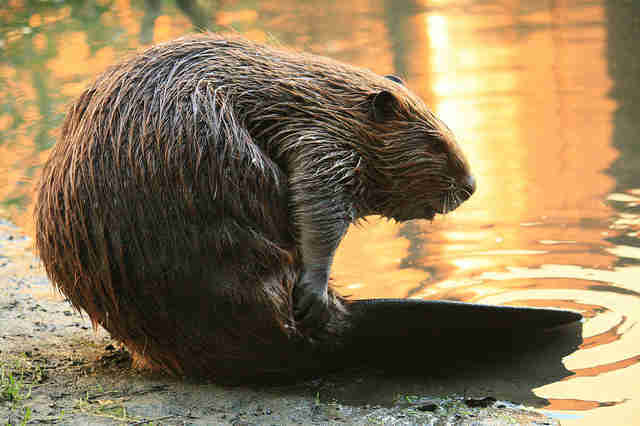 "I'm a huge fan of wildlife in general, and I think the beaver is just a fascinating animal for what it does. I've always respected them, but I have a whole new respect that they were able to build something on this scale. It's really unbelievable," say Mark. "This is the biggest animal-built structure I can think of. It's pretty amazing that an animal was able to do this. And it is a solid structure. I was walking on it, and it is the only bit of solid ground for miles. It was great. They built a really solid dam."